We started the 2014 season off on Saturday May, 24 with a walk lead by Mark Vail on Spring Migrations, Bird Habits, and Habitats. 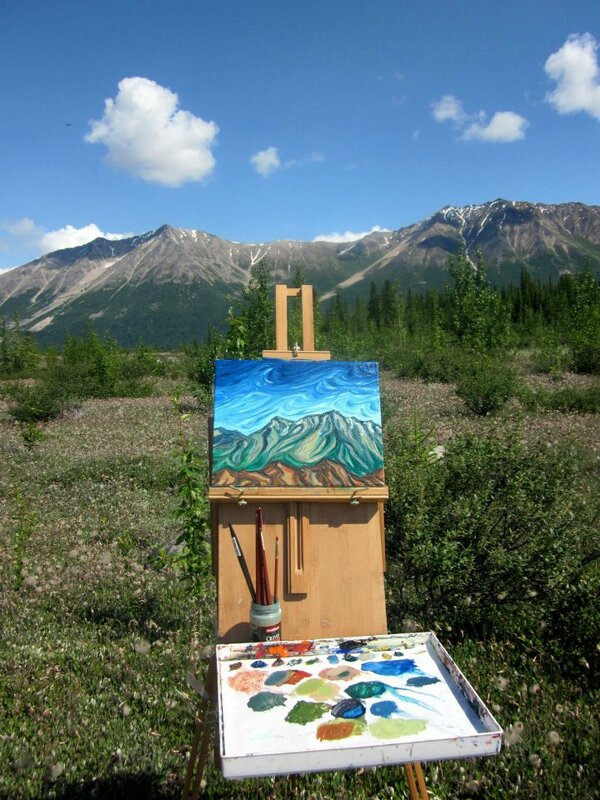 The Wrangell Mountains Center is pleased to announce the following artists and writers who will participate in the 2014 Meg Hunt Residency Program. With over eighty applicants, this was a highly selective process, and we are very excited to welcome this group to McCarthy. Joe Barrington from Throckmorton, TX is a sculptor who recently began focusing more on using metals from found, salvaged, and scavenged materials. He is looking for ways to further develop this process, and to engage the community especially with the storytelling aspect of his work. Joe says “My work has included whimsy, social observations, and more recently I have examined man's relationship and impact on the environment through both subject matter and material choices.” You can see more of his work at redstarstudio.com. Jonathan Gray from Makanda, IL is a performance and “jack of all trades” artist who is most interested in using art and aesthetic communication in their myriad forms as ways of investigating human/environment relationships. He plans to continue his work with local wilderness guides exploring the role that communication plays in their work, and in creating and using puppets to explore the paradox of personification. He plans to work with the McCarthy community to build puppets for the 4th of July Parade. Megan Grumbling from Portland, ME is a poet whose work is strongly influenced by stories, history, and the natural world. She has written a book-length portrait-in-verse of an old Maine woodsman, his landscape, and a sense of work and place that is slowly fading from her childhood home. While in McCarthy she plans to work on her poetry manuscript, loosely titled, Persephone in the Late Anthropocene, which reimagines the classical goddess of the Springtime, who is traditionally forced retreat to the underworld for part of each year, in the age of climate change and unprecedented human impact on the environment. She is also looking forward to soaking up the stories from the surrounding community and environment. Nancy Lord from Homer, AK is a creative writer working in fiction and non-fiction whose interests lie largely in the fields of history, natural history, science, public policy, and Alaska Native cultures. Since 2015 is the 35th anniversary of ANILCA, she is particularly interested in exploring what the lands act has meant for the area, its residents, and its conservation and historical values. She hopes to combine actively exploring the area and learning from others with quiet, reflective time for reading and writing. You can find more about her work at writernancylord.com. Elizabeth Irving is a third generation Alaskan from Fairbanks. She is a multi-media visual artist, primarily working in painting, whose work is influenced by memories and outdoor adventures. She is excited to experience the glaciers, mountains, and rivers in the Wrangell-St. Elias and the inspiration from the grand landscape. She is also interested in sharing her work, process, and family gold mining history while in McCarthy. Learn more about Elizabeth at elizabetheeroirving.com. Artists and writers of all genres and stages in their career are encouraged to apply for one of several two-week residencies. The WMC will make selections through a competitive admissions process. Find more information and the residency application here. Artists and inquiring minds of all genres and skill levels are welcome to reserve this small cabin for a stay of 5-14 days. You can learn more about both programs here.